As part of the new Patient Protection and Affordable Care Act, the federal government has started the process of cutting Medicare reimbursements to hospitals with too many patient readmissions. The U.S. Centers for Medicare and Medicaid Services estimates a total of $227 million will be withheld from 2,225 hospitals in the coming fiscal year. CMS also has reported that on average about one in five Medicare patients are readmitted within 30 days of their last stay, costing the program roughly $17.5 billion annually. This is no doubt a sore subject for those hospitals being hit the hardest with cuts but solutions do exist, especially in the telehealth sector that can be implemented to help minimize the revolving door of hospital readmissions. Now more affordable than ever, telemedicine products provide a sensible and easy solution as doctor and patient can communicate remotely from any device, as well as on a more frequent basis. This increase in communication and patient monitoring will allow patients to stay home more often, rather than making their first option the emergency room. 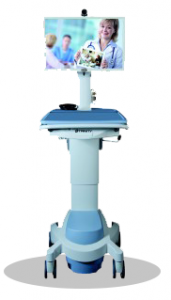 If your organization is seeking a low-cost, high-tech solution to provide accessible healthcare services, then consider Trinity’s Touchscreen Mobile Telemedicine Station. This unit is designed to work in any healthcare environment. Some of the features include an easy-to-use touchscreen interface, high-definition camera and height-adjustable tabletop with antibacterial work surface. Visit our Healthcare Solutions page for more details on Trinity’s Mobile Telemedicine Station. Or, contact us today at 1-800-261-9008 to speak with a Trinity representative to schedule a demonstration at your location or at our Louisville, Kentucky or Sterling, Virginia offices.